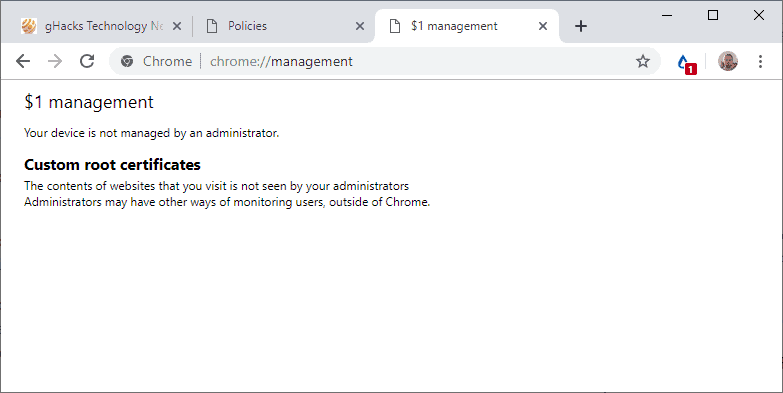 If policies are set that affect Chrome on a device, the "Managed by your organization" entry is displayed in the menu; this can be the case for machines or browsers in Enterprise work environments. There are, however, situations, where policies are not set by the user or an administrator and the message is still displayed. The most likely explanation for that is that an extension has set a policy in Chrome when it was installed. Is your Chrome browser managed? The very first thing you may want to do to analysis the issue is to open chrome://policy/ in the browser's address bar to see if policies are listed. If you see at least one policy, Google Chrome will display the Managed by your organization entry in the menu. Chrome lists all policies that apply to the browser when you load the internal page. Chrome displays "No policies set" if no policies affect the web browser. You may also want to load Chrome://management to find out if the browser is managed by an administrator. If you see "Your device is not managed by an administrator", then it is not managed by one. Policies can still be set and affect Chrome. You have a couple of options to deal with the new managed menu entry in Chrome. One option that may be at your disposal is to remove any policy that affects Chrome. The option may not be practicable in work environments, but if you use Chrome at home, you may reset policies and remove extensions to do so. A better option is to hide the new menu entry in Chrome. Google added a new flag to Chrome's experimental page that you may set to hide the menu entry. Load chrome://flags/#show-managed-ui in the browser's address bar. Set the Show managed UI for managed users flag to Disabled. Doing so should hide the "Managed by your organization" entry in Chrome's menu. 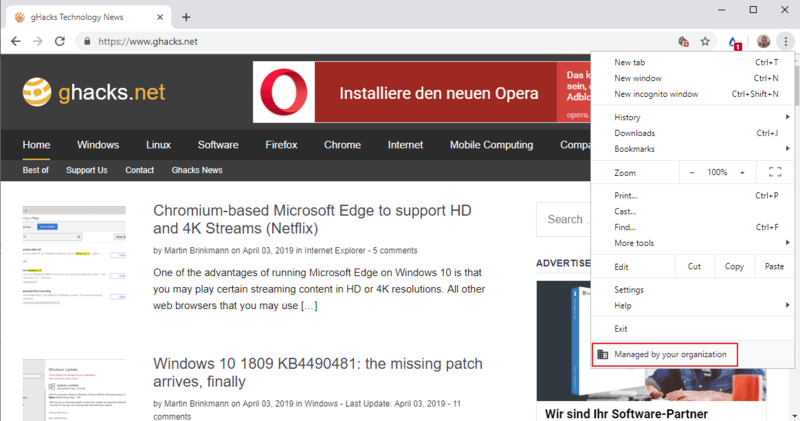 Google published a Chrome policy remover program for Windows that you may run to remove policies that affect the browser. 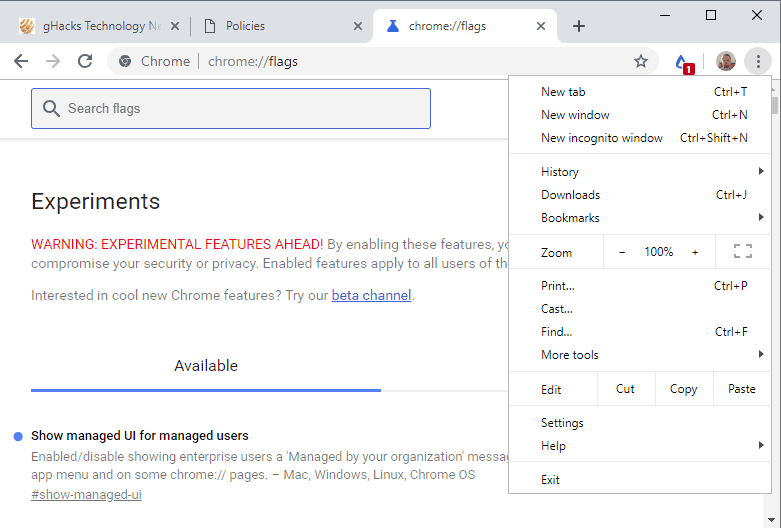 Google Chrome users who run a recent version of the web browser may have spotted a new entry in Chrome's main menu called "Managed by your Organization". what is the blue tier extension in your browser? This just happened to me, there is an active ‘policy’ called ExtensionInstallBlacklist and it has a policy value, which means it’s active. I don’t know where it came from and only understand that it is related to blacklisting or blocking ‘certain’ extensions, and that you might have to ‘whitelist’ extensions to stop it from happening. I also know I don’t want it there. It seems like something a hacker, malware or some extension could exploit. This happened to me on Firefox on Windows 7 out of the blue, whereas I was the administrator and I called all the shots, I couldn’t fix it by creating a new administrator account on Windows either. Surprisingly, it only affected Firefox, as Chrome was still doing OK. The only thing that fixed it was a complete Windows reinstall. Looks like Distill, I think. Supposed to be a water droplet if I recall correctly; I guess a tear drop looks about the same though. After you run SpywareBlaster this message pops up. Thank you so much! But does hiding/disabling it completely solve the problem? Will it continue to affect my Macbook pro operations in anyway? The option hides the entry but it does not change anything related to policies that are set. You need to investigate, using the policies page, to find out which policies are in effect so that you may deal with them. I know which policy is in effect, but I can’t find ANY information on ‘how to deal with it’ or where it came from! I have multiple Chrome profiles setup: a personal profile linked to my Gmail address, a GSuite business account for which I am the administrator, and two more GSuite Business profiles on which I am a user. The policies listed on chrome://policy vary depending on which profile I’m using, but the “Managed by your organization” menu item appears on all of them. I suppose this means that a GSuite admin can set machine wide policies that will apply to other profiles on the same machine? If you’re a home user and want to get rid of the policies you can probably delete these registry keys and see if they return. If they do they are likely set by a current extension.